Forgotten and ignored for centuries, the 2000-year old Colosseum in Rome is packed with amazing facts and info. Once a hotbed for blood-thirsty entertainment, this tourist draw has quite a story to tell. 1. ITS ORIGINAL NAME WAS THE FLAVIAN AMPHITHEATER. The Colosseum was commissioned around 70 CE by the Emperor Vespasian and opened by his son Titus in 80 CE. Along with Vespasian’s son, Domitian, who ruled from 81-96, the three were known as the Flavian Emperors, and the Colosseum was known in Latin as the Ampitheatrum Flavium. 2. A GIANT STATUE OF NERO ONCE STOOD NEARBY. The infamous Nero, best known for killing family members and fiddling, had a giant bronze statue bearing his likeness built in honor of the sun god not far from where the Colosseum would be erected. Modeled on the Colossus of Rhodes, it stood more than 100 feet tall and likely inspired the adoption of the name Colosseum for the amphitheater. 3. IT WAS BUILT ON A FORMER LAKE. Nero’s pleasure palace, the Golden House (Domus Aurea), was constructed after the Great Fire of 64, and it included an artificial lake. After Nero's suicide in 68 CE and a short period of civil wars, Vespasian became Emperor in 69 CE and dedicated a new pleasure palace for the people of Rome. Nero's Golden House had its ornaments (ivory, marble, and jewels) stripped, was buried in dirt, and the Baths of Trajan were built atop the site. The lake was filled in and became the site of the Colosseum. 4. IT WAS CONSTRUCTED IN A RELATIVELY TIDY 10 YEARS. Following the Siege of Jerusalem in 70 CE, Vespasian used the spoils from the Jewish Temple to start work on an amphitheater for Roman citizens. Although he died before its completion, his son Titus was there to open the Colosseum with 100 days of games in 80 CE. 5. IT WAS THE LARGEST AMPHITHEATER EVER BUILT. The Colosseum is a freestanding structure composed of concrete and stone, unlike the majority of amphitheaters at the time, which were commonly dug into hillsides for support. Its shape is roughly elliptical and measures 615 feet long, 510 feet wide, and 157 feet high, making it the largest amphitheater in the Roman world and the biggest ever constructed. 6. THE AMPHITHEATER INCLUDED A SEATING CHART. Designed for all Roman citizens, rich and poor alike, Colosseum spectators were nonetheless separated into different sections based on their social status and wealth. Senators and the like sat close to the action, while women and the poor were relegated to the nosebleed seats. In addition, numbered arches (I-LXXVI, or 1-76) guided people to one of five sections, and entrances, staircases, and walls were used to keep different classes of citizen separate. 7. THE COLOSSEUM COULD SEAT 50,000. With seating width at only about 14 inches per person, massive crowds rivaling modern football and soccer games in attendance squeezed into the Colosseum to watch the spectacle of gladiatorial combat. 8. COMBAT BETWEEN GLADIATORS WAS HIGHLY ORGANIZED. For more than four centuries, a succession of slaves, prisoners of war, criminals, ex-soldiers, and even volunteers did battle in the Colosseum for the entertainment and amusement of Romans. Instead of bloody free-for-alls, by the time of the amphitheater’s opening the sport was more like boxing, with one-on-one fights between gladiators arranged according to size, record, experience, skill level, and fighting style. 9. THE COLOSSEUM WAS A GRAVEYARD FOR THOUSANDS OF ANIMALS. Along with hand-to-hand combat, the Romans staged hunts and wild animal fights that left scores of elephants, tigers, lions, bears, hippos, and other exotic creatures wounded and dead. Nine thousand animals were killed during the Colosseum’s opening ceremonies alone, and 11,000 were killed during a 123-day festival held by the Emperor Trajan. 10. THE COLOSSEUM WAS FLOODED TO HOST MOCK NAVAL BATTLES. Before Domitian had a permanent basement (the hypogeum, Latin for underground) built to house the passageways, rooms, trapdoors, animals, fighters, and workers, the arena floor could be filled with about 3 feet of water and used to stage sea battles. A nearby aqueduct supplied the water, and runoff canals have been identified as the ones that drained the artificial sea out of the Colosseum. 11. IT WAS ABANDONED FOR CENTURIES. Once the carnage of gladiatorial battles lost its appeal and the Roman Empire began its collapse in the 5th century, the Colosseum stopped hosting large public events, and natural disasters like earthquakes and lightning strikes took a toll on the structure. It was abandoned and ignored until the 18th century, when the Catholic Church and numerous popes decided the site should be protected. 12. IT WAS PLUNDERED FOR BUILDING MATERIALS. The beautiful stone and marble that festooned the Colosseum drew the eye of scavengers and builders, who transformed the former amphitheater into a quarry for the cathedrals of St. John and St. Peter Lateran, the Palazzo Venezia, and a multitude of other projects. 13. ONE POPE TRIED TO TURN IT INTO A WOOL FACTORY. The hypogeum was eventually filled in with dirt, and through the centuries Romans planted vegetable gardens there and used the space for storage, while blacksmiths and merchants occupied the vaulted passageways above. Pope Sixtus V, who helped rebuild Rome in the late 16th century, attempted to overhaul the Colosseum as a factory for making wool, with living quarters in the upper reaches and a workspace on the arena floor, but Sixtus passed away in 1590 and the project never came to fruition. 14. IT'S THE BIGGEST TOURIST DRAW IN ROME. Next to Vatican City and its holy sites, the Colosseum is the second-most visited spot in Italy and the most-visited monument in Rome, drawing up to six million tourists a year. 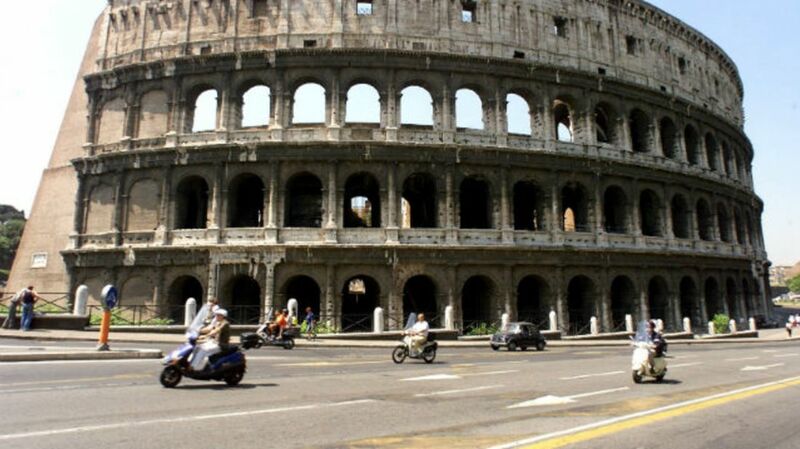 Two-day tickets to the Colosseum and the surrounding Palatine Hill cost 12 euros (about $13). 15. THE COLOSSEUM IS FINALLY GETTING A MAKEOVER. Italian Culture Minister Dario Franceschini announced a $20 million renovation that will include rebuilding the arena floor. This comes on the heels of billionaire Diego Della Valle promising $33 million toward refurbishing the Colosseum, which started in 2013 and includes repairing the arches, cleaning marble, restoring brick walls, replacing metal railings, and building a new tourist center and café.